A middle aged doctor and his estranged wife share a tatty apartment with their daughter, Eliza. They pride themselves on largely avoiding the pervasive system of favours offered and taken to ‘get things done’ in Romania’s dysfunctional society. However, Eliza is assaulted the day before her final school exams, and is in no state to achieve the results needed for a scholarship to study abroad. Having brought her up as they have, should her parents now pull strings, and would she accept the favour? 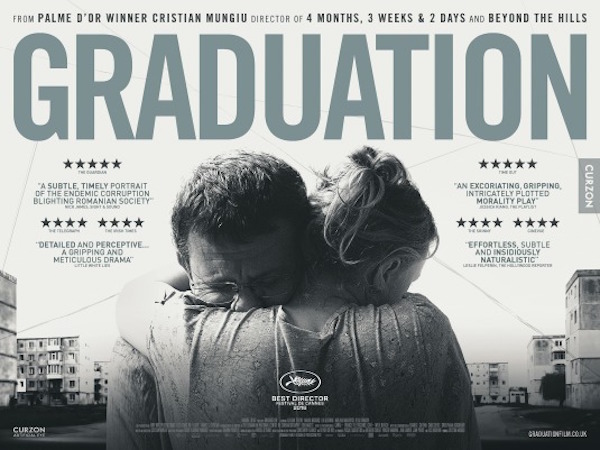 “A masterly, complex movie of psychological subtlety and moral weight” (The Guardian). Here is a link to a Review-critique from The Guardian based on 2 viewings – at Cannes and in London. It includes a link to an ‘official’ Trailer, and also to an interview with the director and the trailer alone is below.